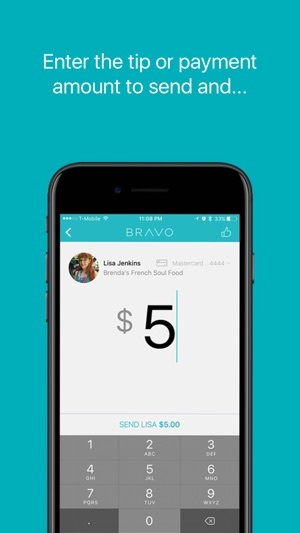 BRAVO is the simplest way to get paid or pay anyone from a mobile device. What happens when it’s time to pay a friend or your favorite bartender, barista, server, musician, valet attendant, concierge, traveling pet groomer, nail technician or pool service but have no cash? • Pay and get paid anonymously with a tap of a finger. 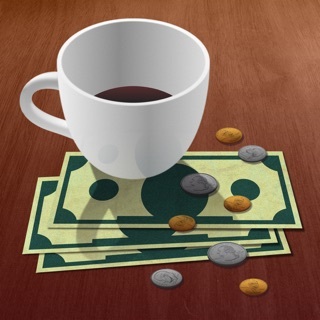 Simply find the user you want to tip or pay by GPS nearby, tap and pay. Send a message and connect. 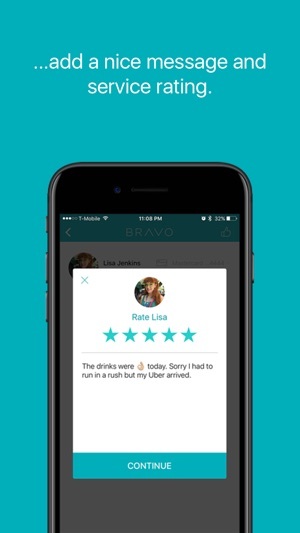 BRAVO helps you pay people beyond your circle of friends. 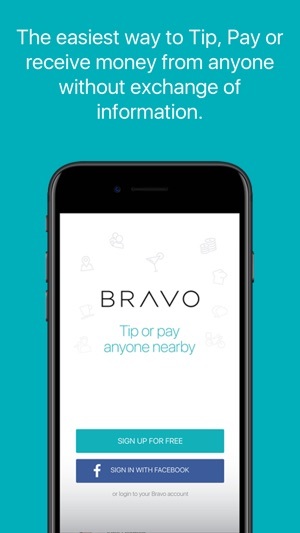 • Bravo helps you to pay and/or get paid without exchanging your personal information; Bravo is low cost without premiums! • You can now send a comment with your payment to begin an exclusive Bravo chat conversation with your old (and new) favorite service professionals. 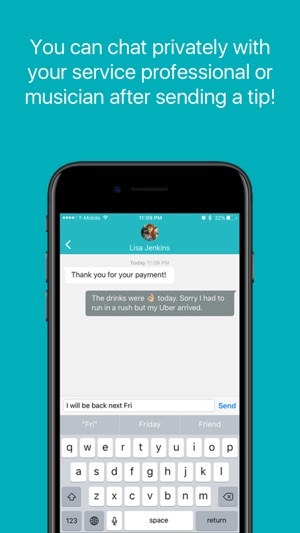 • Customize an auto-reply message to let your favorite patrons know the latest news about you, your bar, band or business. Great for musicians to let others know about your next show! BRAVO uses data encryption to protect your financial information; we do not share any of it or sell it. The app works perfectly!!! I can send money to my family pay for services and tip . Even my little sister use bravo for her small business giving pedicures to the family and friends (she love to have money for makeup 💄 kids this days lol ) . I mean and no need to shared your personal information ! Easy to find you and send money 💵 one time I even set up 2 account and was confused which one the one I call support and right away the help me to find the right one and deleted the other one to prevent confusion !!! The are great need support call them and immediately they will help !!! This app will do to the the Cashless world, what Uber has done to the cab/car service world. 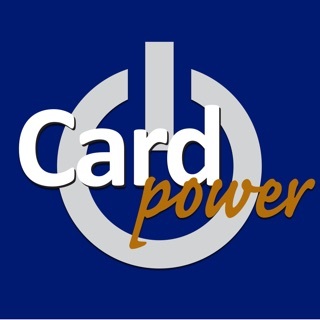 It is quick, seamless and you will never be embarrassed for not having cash again. If you are like me, I never carry cash which is fine most of the time, but on many occasions I have been stuck in a situation where I couldn't tip a valet for my car or the bell desk for holding my luggage or giving me advice in a new town. This app has not only saved me time cause I am not running around looking for an ATM, but it has made me hero to many in the service industry! Thanks Bravo. I don’t understand the negative reviews for this app. Bravo is amazing. Quick, simple, and easy. By far the best thing about the app is that the transactions made are completely safe and protected. I’ve been using their services for many years with my community and have never experienced even the slightest of problems. 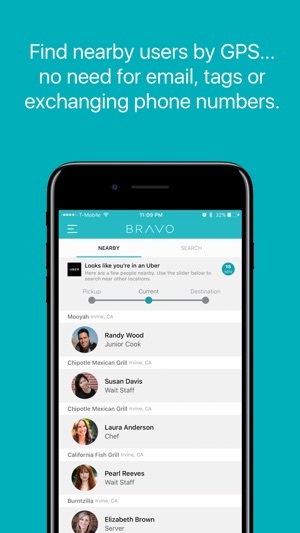 If you want an easy way to split a bill, rent, or anything in between, Bravo is the way to go! Keep up the good work! !